What can other cultures teach us about living a longer, healthier, happier life? CNN's Sanjay Gupta, MD, tells us what he learned from traveling the world. Plus, how to avoid common mistakes when taking medicines. Then, WebMD Chief Medical Officer John Whyte, MD, MPH, talks to actor Michael Jai White about the health benefits of martial arts. Learn the things that can affect your medication, plus how to read a drug label. All About Endometriosis; Is there a Right Way to Apologize; How Well Do You Know Your Thyroid? Karli Goldstein, DO, a gynecologic surgeon with endometriosis, tells us what it’s really like to live with this painful condition. Seth Gillihan, PhD, lists the do’s and don’ts of saying you’re sorry. Take our thyroid quiz to learn more about this powerful gland. Plus, we have timely tips to help keep pollen and other sneeze-makers out of your home this allergy season. Learn the signs that let you know your allergies are out of control, plus some natural ways to keep symptoms at bay. Who wouldn't want to "undo" conditions like heart disease? WebMD Chief Medical Officer John Whyte, MD, MPH, interviews Dean Ornish, MD, on what changes to make. Then, food allergies vs. intolerances -- we break down the difference. Plus, how to stop a hangover before it starts. Cleaning out your home can “spark joy,” but it can also be really hard. Dr. Seth Gillihan talks about why clutter can weigh on your mind, and the benefits of letting it go. Then, learn about some surprising reasons you might feel angry. And is it time for you to schedule a colonoscopy? WebMD chief medical editor, Dr. Michael Smith, explains why they’re so important – and what his own colonoscopy was like. We also cover a few unexpected things that can put your heart at risk. Plus, a good way to watch your salt intake. Learn more about colorectal cancer and what to expect with a colonoscopy. Award-winning MSNBC reporter Trymaine Lee tells us about his heart attack at 38. Then, take our cardio quiz. Plus, will aspirin help your heart, should you test your blood pressure at home, and what helps with cholesterol? Cardiologist R. Todd Hurst, MD, weighs in. And do you know where the nearest AED is? The Truth About CBD Oil, Super Bowl Health Trivia, How to Clean When Your Whole Family Is Sick. CBD oil is trendy, but is it really a miracle cure for, well, everything? WebMD's Chief Medical Editor Dr. Michael Smith has the answers. Do the short winter days get you down? You might have seasonal affective disorder. Learn what it is and what to do about it. Ready for the big game? We found some Super Bowl stats that will blow your mind. Got a house full of sick people? Medical Editor Dr. Neha Pathak explains how to keep it clean -- and keep yourself well. Plus, why you should swap juice for a smoothie. Hear how Kathy Bates, Rufus Wainwright, and other WebMD Health Heroes are making a difference in health and wellness in 2019. Then, are you thinking of mailing in your DNA to learn more about your health and ancestry? Listen to these facts first. And, dermatologist Dr. Laurel Geraghty tells us why January is a great time to think about some changes to your skincare routine. Learn about the incredible work of all of WebMD's Health Heroes. Did you set a goal to lose weight in the new year? WebMD's Chief Medical Editor, Michael Smith, tells us the truth about common weight loss myths. Then James Clear, author of the best-selling book Atomic Habits, shares the four things that you should do to make a new habit stick. Plus, check out our list of the biggest workout mistakes. And are you ready to quit alcohol for Dry January? Concerned that a loved one may be struggling with a mental health problem? Seth Gillihan, a psychology professor at the University of Pennsylvania, shares his advice about when to speak up and what to say. And if you’re heading out of town for the holidays, you’ll want to know about the germiest spots in airports, hotels, and other places when you travel. Plus, get ideas for healthier desserts that satisfy your sweet tooth. We delve deeper into a WebMD special report on how emergency rooms across the country are breaking the law - often without knowing it - when they refuse to treat patients. Medical Editor Dr. Neha Pathak tells us the truth about melatonin. Is this natural sleep aid all it's made out to be? Plus, tips to keep your kids safe this season and how to tell when it's time to ditch an outdated holiday tradition. Confused about the latest studies on fish oil and heart health? WebMD's Chief Medical Editor, Dr. Michael Smith, breaks down what you need to know. Then, we do a gut check on holiday food calories – and how to enjoy them while maintaining your weight. Plus, how long is too long to leave those leftovers on the counter? A little anxiety can be helpful. After all, it's good to be aware of the world around you. But how much is too much? And how do you tell if anxiety is getting the better of you -- or a loved one? Seth Gillihan, a psychology professor at the University of Pennsylvania, has the answers. We also hear from Alicia Clark, a psychologist in Washington, D.C., who says anxiety can be a powerful tool for everyday life. Plus, we'll give you real-time tips to help a friend who's having a panic attack. What We Know About "Polio-Like" Illness; Why Do We Love a Good Scare? We have the latest on the CDC's investigation into the mysterious "polio-like" illness that's spreading across the U.S. Also, what you can do to help prevent Alzheimer's -- starting today. Plus, why do we love scary movies, haunted houses, and things that go bump in the night? Finally, how to make your favorite fall foods a little healthier. Electric Scooters: Are They Safe? No, the Flu Shot Won't Give You the Flu! Electric scooters have literally popped up overnight in many cities across the U.S. Leigh Vinocur, MD, an emergency physician in Baltimore, talks about the safety risks that come with this zippy new mode of travel. Flu season starts up soon. We’ll tell you everything you want to know about the shot, including why it can't give you the flu. Also, get the truth about aspirin and your health and learn how to shrug your way to better posture. STDs are more common than ever, with record-high rates. Our Chief Medical Editor, Dr. Michael Smith, tells us why it's happening and how to protect yourself. Also, is coconut oil healthy or not? Plus, get a pediatrician's tips to help your kids thrive now that they're back in school. Resilience can get you through tough times. Our Medical Editor Dr. Neha Pathak tells us what helps. Find out about surprising things that can spike your blood sugar. Take our quiz on what boosts your mood. Plus, learn why you might want to do a little babysitting, for your own health. What Happens When You Do Whole 30 for 21 Days? We challenged WebMD staffers to try the Whole 30 eating program for 21 days. Our Chief Medical Editor Dr. Michael Smith talks with two participants about their experiences. Editor Stephanie Snipes provides a cook’s perspective and shares how changing her diet helped ease some aches and pains. Editor Maira Olivera discusses how Whole 30 helped lower her blood pressure, and offers tips on how to stick to a plan when you’re eating out. Plus, find out how a new recipe can help you avoid takeout temptation. The Very Real Grief of Miscarriage; Is Your Smartphone Hurting Your Health? Psychologist Dr. Susan J. O'Grady on how to process the grief that comes with miscarriage, and what not to say to someone who has been touched by it; Dr. Neha Pathak explains why you might want to dial back your smartphone use; plus the connection between distracted eating and your weight. Easy Ways to Upgrade Your Diet; Are You Drinking Too Much? Wendy and Jess, hosts of the the Food Heaven podcast, share their must-have kitchen gadgets, meal-prep tips, and eat-healthy advice; WebMD news editor Valarie Basheda discusses a concerning trend -- more women are drinking too much; plus, how you can benefit from some "good" stress. Beau Coffron, better known as Lunchbox Dad, shares ideas to up your lunch game; WebMD medical editor Dr. Neha Pathak on strategies to stay sane during the back-to-school hustle; plus, tips to get your kids talking. We challenged WebMD staffers to try meditating for 21 days. Our chief medical editor Dr. Michael Smith talks with two participants about their experiences. Health editor Mark Spoor shares how meditation helped him curb anxiety and stress, and content strategy manager Anna Lanfreschi opens up about how meditation finally helped her get a good night's sleep. Plus, get tips on how to start meditating and how to avoid common pitfalls. Dr. Michael Smith on how to protect yourself from heat stroke; summer health myths that might surprise you; Dr. Neha Pathak on the importance of the age you feel; tips to keep your dog safe around water; and why you should consider putting your nose in book. 15 Foods that Give You Energy; Do You Have Summer Depression? How to recognize and manage summer depression; WebMD editors Stephanie Snipes and Robert Allen on what to eat for an energy boost; Ronith Dunn on day-to-day life with multiple sclerosis (MS); and a simple trick to prevent overeating. 5 Mistakes That Boost Blood Pressure Readings; How Safe is Supermarket Meat? Common mistakes that raise blood pressure readings; WebMD medical editor Dr. Neha Pathak on how to protect yourself from superbugs in supermarket meat; tips to keep your pets cool; how much do you know about how your brain works; and why you should take a break from tech. Fireworks safety tips; WebMD Chief Medical Director Michael Smith on how exercise can fight depression; top 5 low-cal cocktails; colon cancer screening news; and how to give your brain a boost. Tips to eat healthy all summer; WebMD news director Valarie Basheda on why women's health care falls short; who really needs travel vaccines; are you too busy for your own good; and how making time to worry may help relieve anxiety. Dad's Day Edition: Raising Smart Kids; Surviving a Heart Attack; Get a PSA Test? Good news in men's health; dads who exercise may have smarter babies; who should get a PSA test; life after a heart attack; best health advice; and why you should talk your kid's ear off. This week, early mammograms may mean less invasive breast cancer treatments; summer health hazards to avoid; guest Dr. Jessica Helm on how certain beauty products may affect your health; the perks of a midday snooze; and a surprising mood booster. This week, certain foods may affect when menopause starts; the truth about vaping; how one woman moved past the guilt of being diagnosed with type 2 diabetes; and a simple tip to make exercise feel easier. This week, in our summer safety special: What to know about Lyme disease; how to pick the perfect watermelon; sun protection tips; the truth about dry drowning; and how to get your day off to a great start. In this episode: sitting hurts your body and your brain; loneliness is being called a widespread public health problem; how one man lost 100 pounds; and tips to tap into your creative side. This week, in our special Mother's Day episode: Positive developments in women's health, modeling healthy habits for kids, share-worthy advice from moms, cutting yourself some slack, and a tip for busy women everywhere. This week: New drugs offer hope for hard-to-treat migraine; expert answers to questions about the romaine recall; morning people may outlive night owls; how multitasking makes you less productive; and help for when you hit the afternoon slump. This week: Weight loss without counting carbs, calories, or fat; when pain relief morphs into addiction; social media and kids’ mental health; and how to feel like a winner. This week: The controversy brewing over coffee and cancer; a little inspiration that might just motivate you to exercise; how some cleaning products may affect your health; and a habit that's good for you -- and for someone you care about. This week: Experts are hopeful that a vaccine may cure cancer; the link between salt in your diet and dementia; an inside look at what life is like with schizophrenia; how one woman lost 80 pounds -- and keeps it off; and how to refresh your morning routine. This week: A new study says drinking alcohol is better than exercise for longevity; an expert's take on the keto diet; new hope for people with life-threatening peanut allergies; how one couple faces life with bipolar disorder; the truth about drinking bottled water; and how to set healthy habits you won't forget. 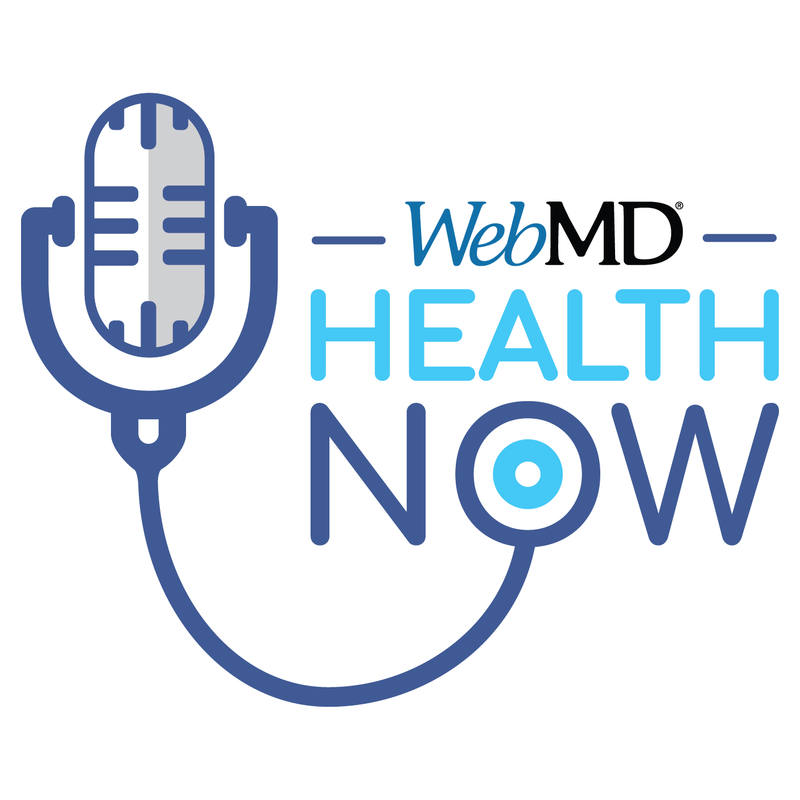 This weekly podcast from WebMD covers all things health: your body, your brain, and your wellbeing. Each week, host Carrie Gann will be joined by one of WebMD's staff doctors, as well as the occasional guest – to talk about the health topics that mean the most to you. Available on Thursdays, starting April 5th. Carrie Gann is the host of Health Now and a senior health editor at WebMD. She’s been reporting on health and science topics for more than 10 years, from cancer research to neuroscience to children’s health and fitness. Some of her favorite projects have included stories about concussions in women athletes, access to HIV medications, and research to make better batteries for electric cars. Born and raised in Oklahoma, Gann is a graduate of Emory University and the University of North Carolina at Chapel Hill. In her spare time, she likes taking walks with her husband and two dogs, cooking (but mostly eating what she cooks), jogging, and any kind of trivia.